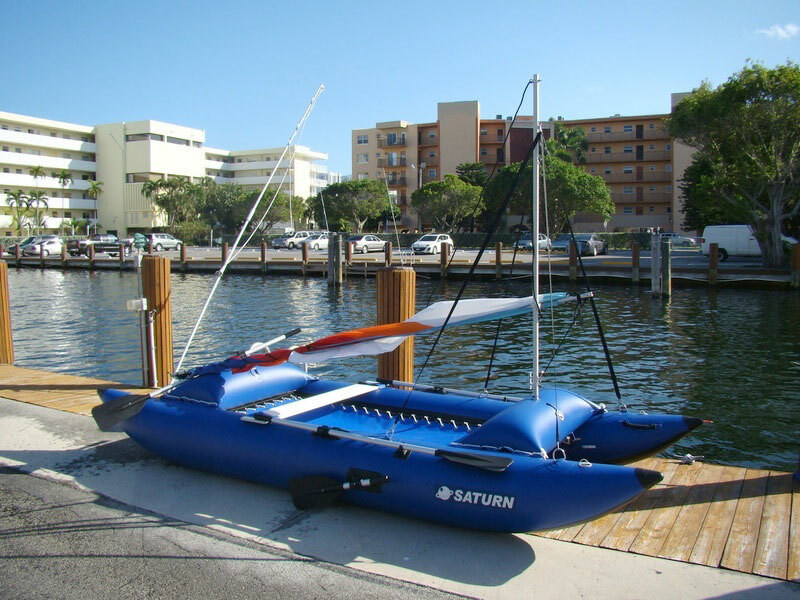 To sail our SC396 inflatable catamaran with Latin sail rig you will need to use oars to row into the wind, then raise oars and lock oars into oarholders, drop down rear oar that will act as a sailboat rudder. Then raise the sail and run rope attached to the lower boom through the D-ring in a rear fender. 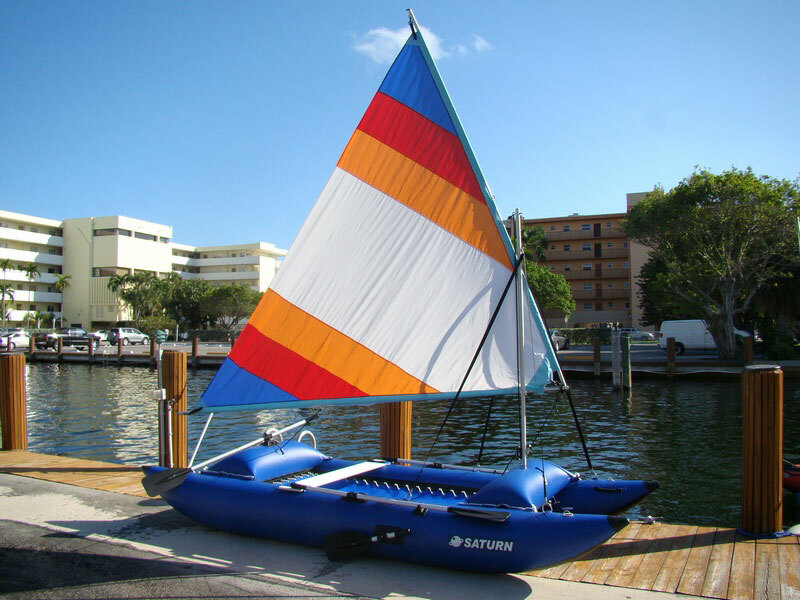 Sit on a tube or seat facing your back toward the wind, and using rudder oar make several strokes until catamaran will turn perpendicular to the direction of the wind. 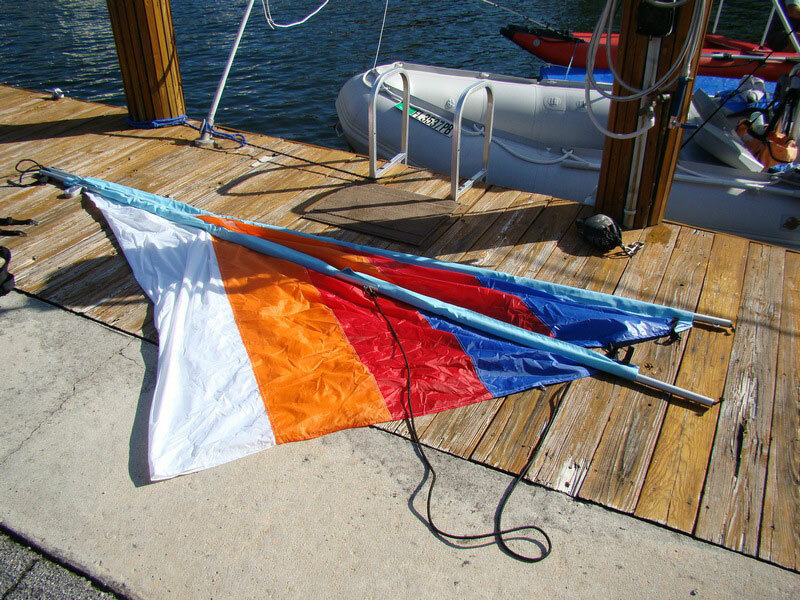 Make sure that keel oars attached to side oarlocks are submerged into the water, and pull string of rope that run through D-ring to catch wind into the sail. Make sure that rudder oar is submerged into the water to provide directional stability. You can't run strait into the wind, but you can get under slight angle into the wind, perpendicular to the wind direction or along the wind. 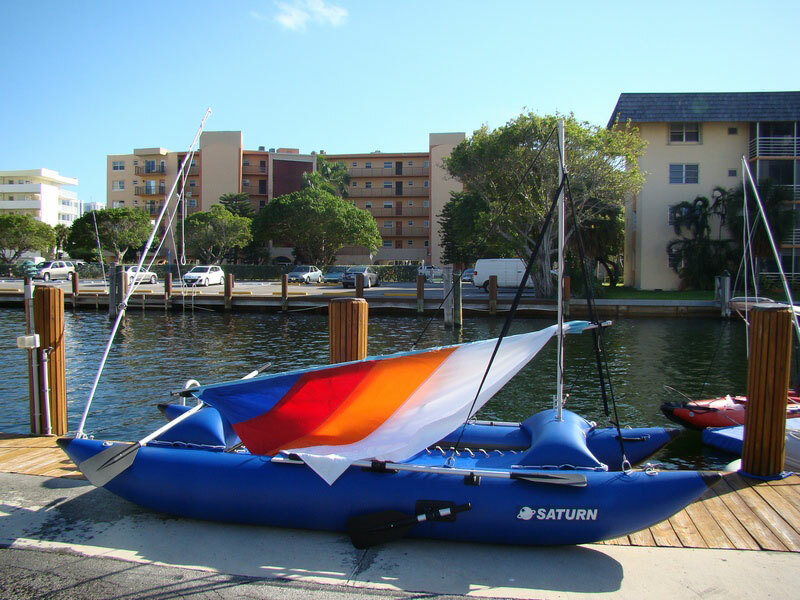 To make turn to change direction, simply use oar rudder to paddle to opposite direction and quickly change sitting onto opposite tube to face wind with your back in order to provide counter-weight to the force trying to overturn catamaran in a strong wind. 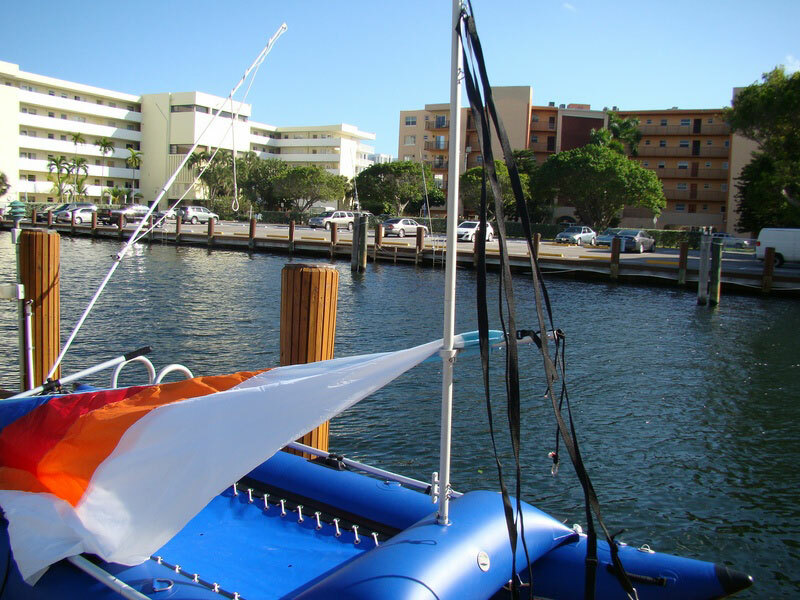 If catamaran will ever become overturned by strong wind, do not panic. 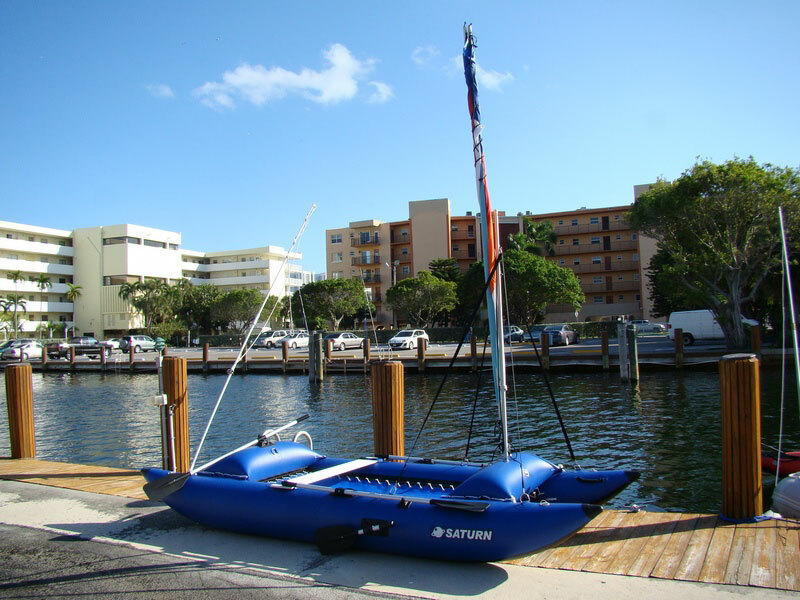 Swim to the bottom side of catamaran, and pull on a tube that is in upper position with all your weight, until catamaran will not return to the upward position. Short rope may be helpful for this maneuver. Unroll sail on a flat surface. Each long boom consist of 3 separate shorter aluminum tubes that need to be snapped into each other at the ends. 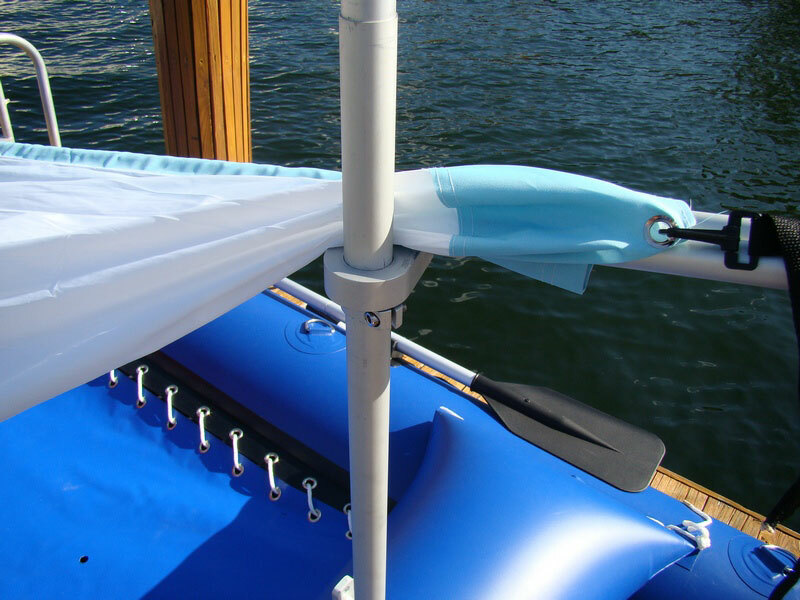 Attach edges of sail to the brackets at each boom end and tighten adjustable string. 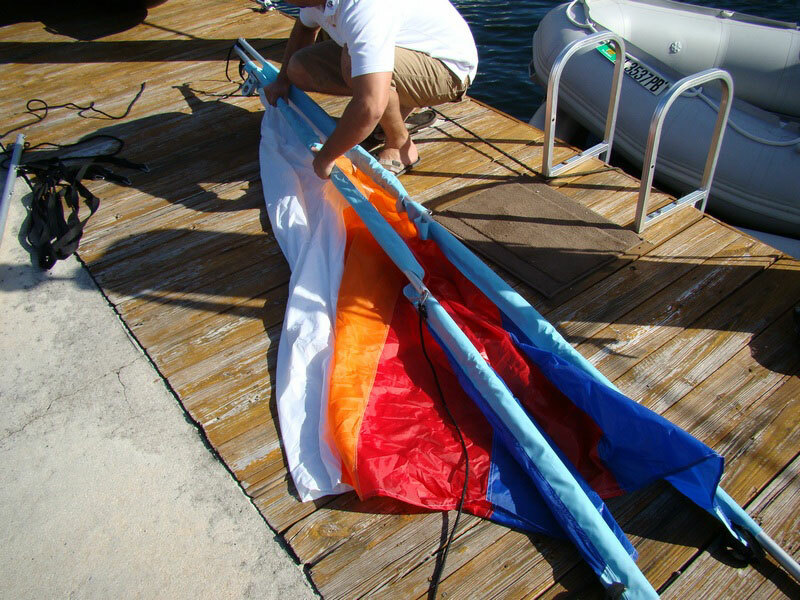 Attach inner edge of the sail to cross point of both booms and adjust string such way that there is some tension. Slide aluminum directional ring of assembled sail over lower part of the mast. Snap upper part of the mast over lower part with middle brackets facing outward and upper O-ring facing inward. Run rope through O-ring at the top of mast. Another end of rope attach to top bracket on upper boom. 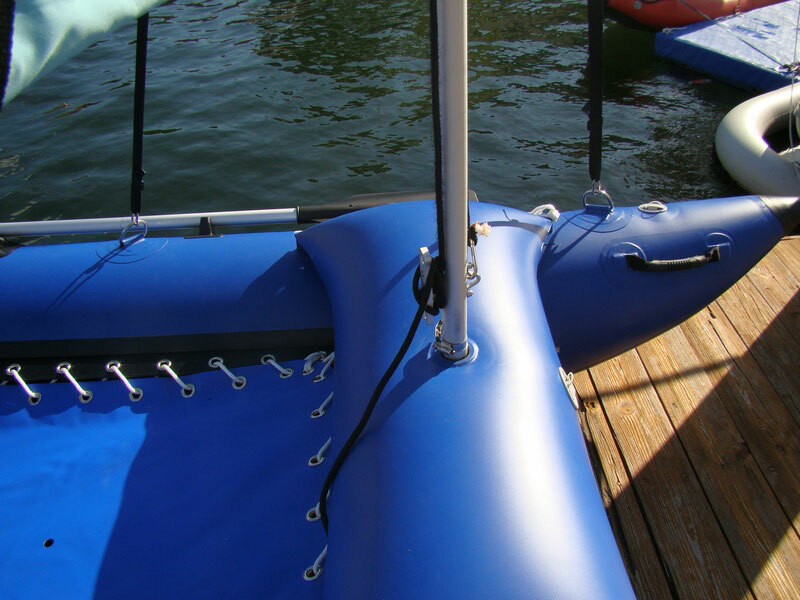 Attach 3 adjustable strings to middle brackets on upper part of the mast and to the D-rings on catamaran tubes. Adjust tension to provide rigid support for the mast. Sail kit comes with 3 strings. You can run rope between 2 front D-rings and attach front string to the middle of that rope. Pull free end of rope that goes through upper O-ring and raise sail. Run 2nd rope attached to lower boom bracket via D-ring on rear thwart. 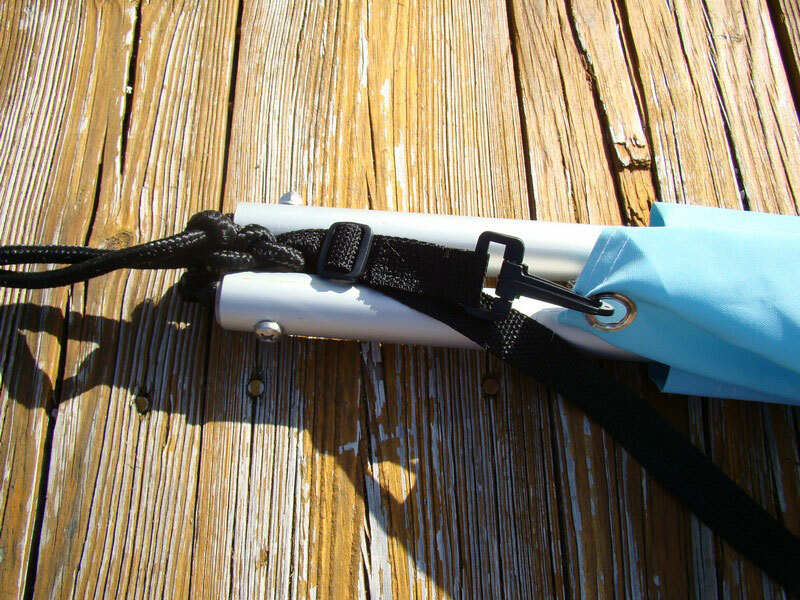 Secure loose end of the rope that holds upper boom in raised position to the cleat at the base of the mast. You are done! 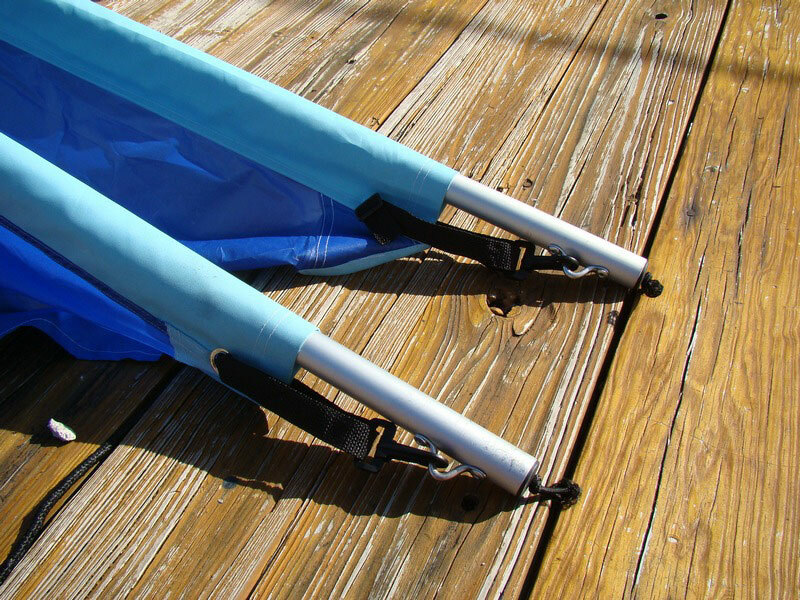 For easy lunch and storage you can lower the sail and wrap upper and lower boom together using rope attached to lower bracket. Then pull on a rope running through O-ring at the top of mast and raise both booms to clear up space on a floor. Secure end of the rope that used to raise sail to the cleat at the bottom of the mast. Please note that this model is still in a process development and improvment. It is very well possible that whole system might benefit from customer's adjustment or additions. It is also possible that you will need to improvise to get best possible setting for the sailing of this sail cat. We will be improving both items based on our customers recommendations.